I haven't posted anything since last March, but that doesn't mean I've stopped looking for virgins, saints and other front yard statuary. 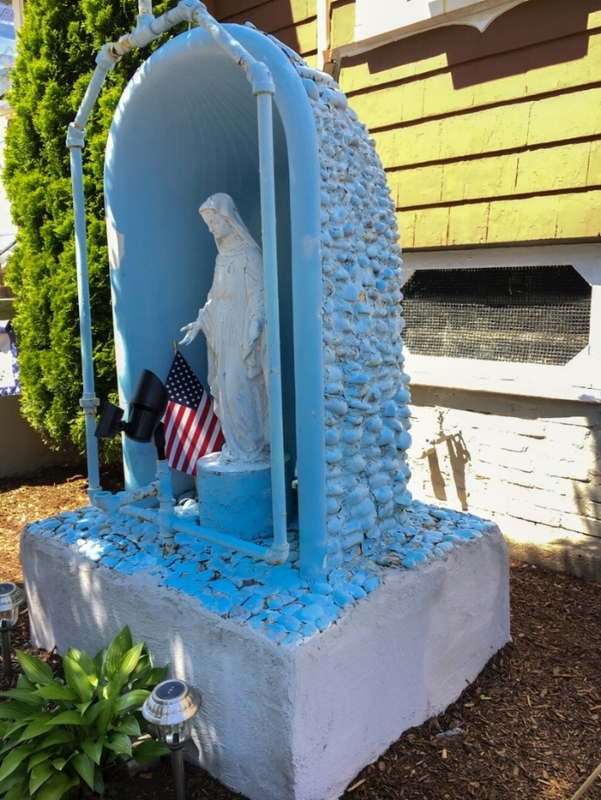 My favorite sighting this summer is this beautiful East Somerville Madonna in a blue stone-encrusted bathtub, framed by matching blue plumbing pipe. Since my last post I've also had an opportunity to search for front yard shrines in a new location—New Bedford. This summer Reebee and I were driven around that city by our friends Nate Bekemeier and Penny Brewer, who live in Fairhaven, which is directly adjacent to New Bedford, and where Penny's banner making business is located. With them as our guides, I had the pleasure of getting to know an unexplored (by me) Virgin territory, this one in another Massachusetts city with a large population of Portuguese and Azorean-origin residents, and known (among those interested in these things) for its front yard statuary. In concept and execution New Bedford's front yard shrines look a lot like Somerville's, although IMHO Somerville seems to have more of them per neighborhood than New Bedford, and in general Somerville's are more inventive. OK, I'm biased in favor my home city, of which I'm a booster. Sadly, Somerville's front yard shrines are disappearing by the month as a result of gentrification, so this may not hold for much longer. Nate and Penny have also caught the Bathtub Madonna-seeking bug, and have been sending me photos of shrines they've encountered in New Bedford since our first shrine-seeking foray in August. Below is an outstanding New Bedford shrine they photographed about a month ago, and despite my Somerville-centrism, I have to tip my hat to this one: the architectural design and rendering are truly original and singular. I haven't seen it myself yet, but it's definitely on my list next time I visit New Bedford! At the risk of sounding too demanding, I hope that by the time I get to see it, the owners will have discarded the blue plastic soda bottle in the belfry on the right, which distracts from the shrine's carefully symmetrical aesthetics (down to the twin white rocks). Welcome to my very occasional blog! Most of my photos of Virgins and saints are in the photo essay, but since I'm still taking photos on my walks, if I catch something interesting, whether it's a Virgin or saint I've missed, or a new perspective on a shrine I've seen before, or simply some other quirky Somerville thing, I'll post here. So here's my first blog photo, taken on the first day of spring.